Goalkeeper Jovani McCaskill was in need of a signature performance Thursday night at home. With first place for the Big West on the line, McCaskill was chasing her own line of history. 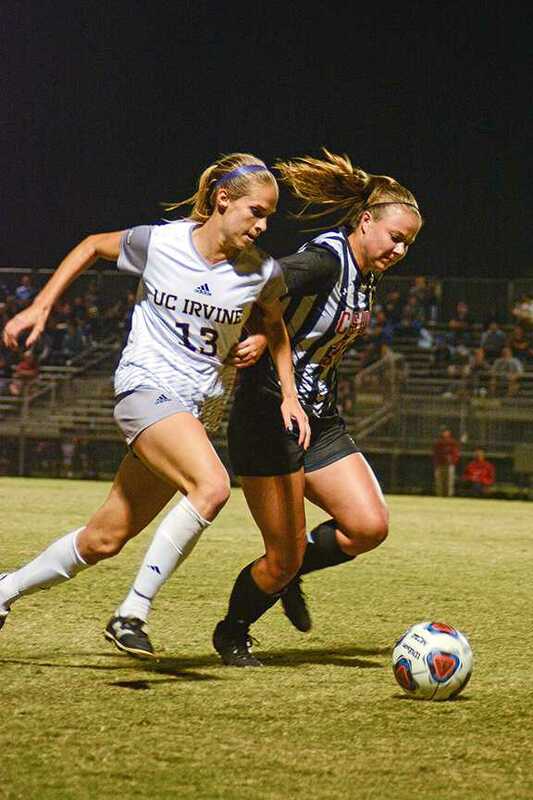 McCaskill had four saves, and freshman Sydney Gilbert scored her first goal of the season in the 32nd minute to beat UC Irvine for Big West supremacy in a grind-it-out affair, 1-0. It was the Matadors fourth consecutive win and pushed CSUN into a first place tie with the Anteaters in the Big West Conference. McCaskill, with her 27th career shutout, tied current keeper’s coach and former player Cynthia Jacobo for the most in program history. McCaskill had four saves including two diving to her right side against UC Irvine leading scorer Noel Baham. The Matadors played balls over the top and applied pressure to Irvine’s back line. The lone goal of the match was set up on a throw in Destinney Duron. Duron heaved it from 18 yards outside Irvine’s goal. The ball landed perfectly at Gilbert’s feet. Gilbert took a touch left and fired a shot past Anteaters goalkeeper Maddie Newsom to give CSUN the 1-0 advantage. The Matadors have shown during their four-game winning streak that they have some grit left over from last season’s team that won the Big West regular season title. In the 82nd minute, McCaskill got caught too far off the box in the 82nd minute and Irvine’s Sydney Carr had a chance to tie the score, but was denied by Katelyn Von Meter. Von Meter bicycle kicked the ball and was able to redirect Carr’s shot out-of-bounds to alleviate Irvine’s pressure. CSUN has gone from a team in search of its identity midway through the season to the hottest team in the Big West Conference. The Matadors have scored eight goals in its last five games and have recorded two shutouts during its recent winning streak. McCaskill said the motivation comes from having lost 3-0 to Cal State Fullerton in its first conference game.